‘Mexico’s main problem is corruption; we must achieve the rebirth of the country,’ says leftist candidate, the presidential race frontrunner. 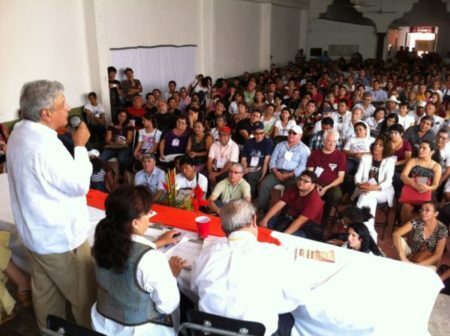 MERIDA — The national leader of the National Regeneration Movement (Morena) party on Sunday July 2 signed a political agreement on Unity for Prosperity, the People and the Rebirth of Mexico, before thousands of supporters who gathered in Merida’s Park of Peace from very early in the morning. There, for more than an hour he gave a speech in which he explained in detail what he will do in the government he will lead as he assured that “we are on the eve of achieving a transformation in the nation,” reported Diario La Verdad. He said that July 1, 2018 will define a fourth transformation in Mexican history, since he listed that before this, there were three major movements: that of independence; The reforms of Juarez; and the Mexican Revolution. He said that he talks about this historical background to put in context what Morena’s goals are as a party and it is not about power for power’s sake. “Unfortunately, history repeats itself by mentioning that during the porfiriato the goods of the nation were delivered to foreign individuals, in events similar to what happened now with the delivery of national goods and resources such as PEMEX and CFE to transnational corporations,” he said. He pointed out that he has been urged not to talk about the power mafia in order not to frighten some segments of the population, such as the middle class or advanced economic sectors. But he stressed that he cannot avoid it, charging that the country has now been dismantled and plundered by large businesses that have been made under the protection of public power. “Something else I will comment on a business, which has to do with the privatization of Fertimex, which were sold and one of those plants is located in the port of Coatzacoalcos, which was abandoned and almost converted into junk. The current president rescued it in 500 million dollars when its real value did not surpass 50 million dollars,” he said. He assured that this fact is not of public domain and is only an example of the businesses that are made under the protection of the public power. Some of the actions listed by López Obrador that would be undertaken in the federal government upon arriving at the Morena presidency include: End corruption, not steal, exercise austere government, change oil policy, build refineries in the country, reactivate the domestic market, sell planes and helicopters, convert Los Pinos into a common recreational area, and grow the index of Economy up to 6 percent. He said that he will guarantee food for Mexicans and rural employment, and on this same subject he said that although plans to promote primary activities will take place throughout the nation, there will be “preferences” for the south – southeast region, because it is the Time of this region,” he said.